If you're looking to buy a car, there's a pretty good chance you've visited Edmunds.com at some point. The American-based automotive resource company which was founded in the 1960s has evolved from its grassroots as a paperback newsstand publication to one of the most well-known online sites of its kind. From new cars to old cars, Edmunds.com dives deep into the automotive world and provides extensive knowledge for even the most seasoned of buyers. So, it's no surprise that the company's office is equipped with retro and new cars alike -- along with a massive slide that transports employees from the second to first floor. Edmunds.com office is located in Santa Monica, California and has a large floor plan that allows the space to have an indoor-outdoor environment -- something the employees love. 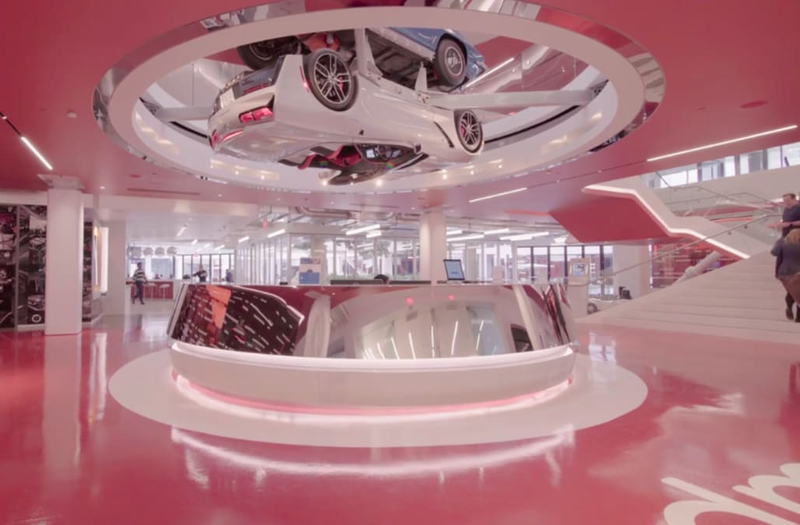 The office also features a one-of-a-kind reception desk with two Chevrolet Corvettes that rotate over it. And, that's not the end of the unique features. You can also find a 1948 Cadillac Fleetwood which has been transformed into a bar that serves beer on tap during company happy hours. From the array of vehicles to the inviting workspace, Edmunds.com has one 'wild' workspace that is truly one to envy.